Syriza tables no-confidence motion as Greek government evicts workers from state broadcaster. As always in Greece, the message is two-faced, one visage for foreign consumption, the other for domestic. What it’s supposed to say to representatives of the Troika who are, once again, in Athens (if they’re stupid enough to buy it, or diplomats enough to pretend they have) is that everything’s under control: we’re meeting our obligations, turning around the economy, cracking down on lawlessness, breaking the unions. (The original shutdown of ERT was ostensibly designed to meet the Troika’s demand for public sector lay-offs.) The message to Greeks is this: You may see a government that’s scrambling to appease its creditors without upsetting its cronies, that’s lost control of the streets and its own half-tamed heavies, that has no idea how to get out of the maze; you may be jobless, hungry, disoriented and lost, looking ahead at a winter without heat or hope; you may think some kind of resistance is still possible. But the evidence of your senses is false, or at least irrelevant. Look! We’re installling free WiFi all across the country! Greece is a success story! And if you won’t line up behind our version of reality, we have the power to persuade you. Against the voice of a man in a room with a microphone, we play helmeted troops with teargas and batons. Of course, people won’t be silenced, especially not now. 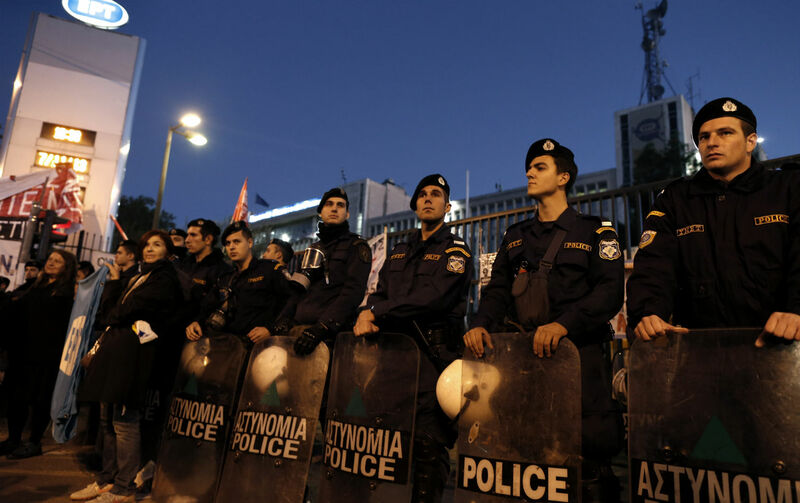 (A few days ago, a bunch of Dogberries from the Greek police turned up at Radiobubble, a citizen radio station run out of a café in Athens, and threatened to prosecute because people were “talking too loudly” in the street outside. Perhaps they had read about it in The New York Times.) But (let them eat WiFi notwithstanding) most Greeks get their news from private television stations owned by politically well-connected oligarchs—which were given control of the digital airwaves by a vote in parliament hours before this morning’s raid on ERT. And the cacophony of unsourced hysteria and conspiracy theories that has long filled much of the Greek media, across the political spectrum, doesn’t help the quest for a coherent, usable description of what’s happening. On the other hand, as I write, the left party, Syriza—some of whose MPs were violently prevented from entering ERT’s headquarters this morning—is tabling a motion of no confidence in the government, to be debated tomorrow. The ruling coalition has a majority of only five MPs, some of whom blocked a motion to impose a new property tax a few days ago; of course, the pressure on them to conform will be immense. The private channels will broadcast this—with dire predictions of catastrophe—as another “thriller.” Meanwhile, protesters have gathered outside ERT’s headquarters in Athens and Salonika; one banner reads, “Deep Soul.” And ERT journalists and musicians are still broadcasting on the internet, from the street. Bob Dreyfuss tells us what the end of the M23 insurgency in the Democratic Republic of Congo means.